Confession: The weather is 13 degrees Fahrenheit in Meadville, Pennsylvania, and according to weather.com it feels like 1°. But it’s March 5, and today I saw the robins. Here’s a sweet idea for welcoming spring. Your favorite cupcake recipe + green-tinted frosting + sugared marshmallow Peeps = kiddo happiness, big time. If you have more patience than I (or less cupcakes) you could make proper grass with stars. I did a star tip swirl instead: five seconds per cupcake. Do you make food that looks like spring? I want more ideas! A few drops of green color in shredded coconut makes a kind of grass-like cake topping. Stick it on with some frosting. 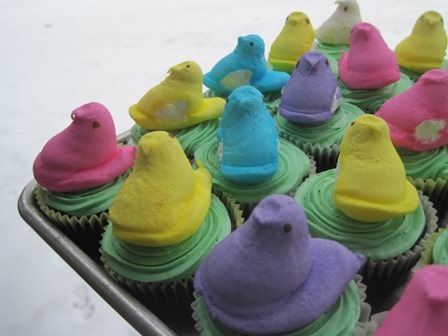 For these, you could try rolling just the edges of the cupcake in it, to give a place for the Peep to stick. Pardon me as I hurl. Looks great until you get to the peeps. Well, thanks for that heartwarming vote of confidence. 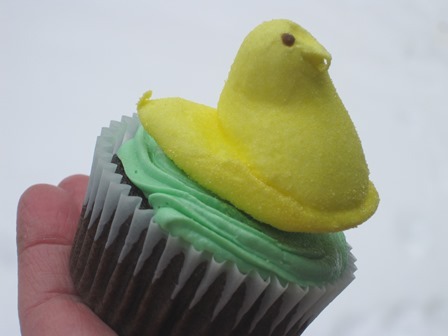 Of course you could (theoretically) remove the peep before enjoying the cupcake. Like I did. I’d remove my peep too…but what fun for the kids! 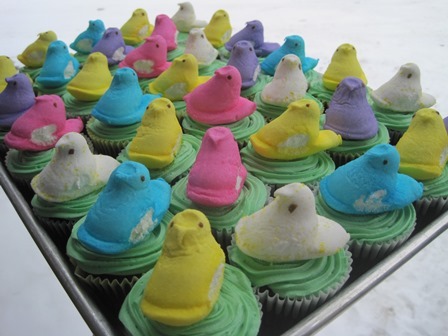 They are awfully cute, but I’m with Travis on the taste of the peeps. 🙂 But we’ve had hurling at our house lately anyway. So what do I know? Aww, so cute. I like them, peeps & all. My dad loves these peeps right from the freezer. It was always special when he brought them home around spring/Easter time. These are fun! I think the recipe we used when I was a child involved peanut butter but I couldn’t find that one. We do a sunflower cake with peeps every year, but the cupcakes look easier and so colorful! Maybe I will break with tradition this spring.